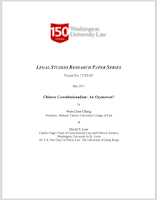 Abstract: Chinese law and comparative constitutional law are both thriving fields, but the comparative study of Chinese constitutional law remains rare. Part of the explanation may lie in skepticism on the part of comparative constitutional scholars as to whether China can be said either to possess a genuine constitution or to practice constitutionalism, due to its lack of judicial review and disregard for civil and political rights. This chapter seeks to explain why it is not only appropriate, but also highly beneficial for comparative constitutional scholars to study Chinese constitutionalism. First, we argue that “Chinese constitutionalism” is not an oxymoron, and that definitional objections to the study of Chinese constitutionalism are therefore misplaced. We articulate a pluralistic framework for defining the terms “constitution” and “constitutionalism” that incorporates three types of criteria: regime goals, regime characteristics, and regime performance. The result is a rich matrix of definitional possibilities, many of which are capable of encompassing China and other authoritarian regimes without either implying approval of their practices or conflating them with liberal democracies. Second, we explain why the study of Chinese constitutionalism would affirmatively benefit both the field of comparative constitutional law and the development of constitutionalism in China. Not only is scholarly engagement with China more likely to promote constitutional development than scholarly indifference, but it also provides an opportunity to broaden and enrich the discipline of comparative constitutional law by focusing our attention on important and recurring constitutional phenomena other than judicial review. (4) the phenomenon of dissonant constitutionalism, wherein a constitution is blatantly violated yet at the same time commands too much normative authority to be simply ignored. In such situations, the constitution may function as a constructive irritant: in the best-case scenario, the unresolved contradiction generates genuine constitutional discourse that in turn fuels the development of the constitutional order.